Optimum Biometric Labs has developed and launched a comprehensive series of BioUptime Partner Programs. A working partnership is essential for business growth and for creating customer success stories which are the principles behind the design of these programs. The BioUptime Partner Programs are Integrator & Solution Partner, Value-Added Reseller (VAR) Partner, Original Equipment Manufacturer (OEM) Partner, Managed Service Provider (MSP) Partner, BioUptime Ready™ Partner, and Deployment & Consulting Partner. BioUptime is a monitoring software that simplifies management of Reliability, Availability, Maintainability, and Performance of infrastructure components such as devices, applications and end-to-end services. It uses real-time data to detect, diagnose, and report issues in order to assist customers to meet or exceed their business goals and requirements such as meeting the target metrics in Service Level Agreements. The company has also designed a BioUptime Referral Partner Program with the objective to reward and recognize BioUptime Referral Partners who receives a referral fee for engaging with or referring to Optimum Biometric Labs an existing or a new project. CIOs and CTOs like it; Enterprises like it; Startups like it; Investors like it; Researchers like it; Users like it. They invest in it, promote it, deliver it, research in it, refine it, and use it [ex. 1-12]. It is our time’s most profound machine to explore with; to explore everything. Now, why should the biometrics market and industry take a closer look at it? Read on and Welcome to The Era of Big Data and Metrics! The hype aside, it has been there for years: Big Data and its use cases. For ages, the diversity and scale, not to mention the necessity, of its applications and advantages have been tremendous: Aerospace industry has used it to monitor and protect spacecrafts and crews; Formula One teams have applied it to optimize car performance and racing strategies; Rotating machine industry has implemented it to predict and prevent machine part failures. Limitless examples of Big Data can be given in multiple sectors, markets, and fields with totally different kinds of business objectives. It has become increasingly obvious that applications of Big Data are expanding immensely: from mining the social web to maximizing efficiency of green-tech’s smart-grids; from ocean observation to The Human Brain Project and to human genome projects; from personal fitness and health monitoring to Hans Rosling’s moving bubbles that visualize global trends… the list can go on and on. Primary drivers for this transformation to mainstream, according to IDC’s annual study, are decreasing cost in storage, increasing connectivity (e.g. cloud), sensors, data capture and analysis tools. And then, there is the vastness and variety of data: 1.8 zettabytes in 2011 and growing exponentially; see IDC’s report “2011 Digital Universe Study: Extracting Value from Chaos” or see its infographic. Last but not least, what I would add to IDC’s analysis is birth of new metrics on daily-basis and in everywhere. Thus, let’s agree on the following: biometric features, templates, or even any kind of transactional data (whether synthetically generated or as result of any application usage) by themselves are not Big Data. In the broadest sense, Big Data in Biometrics is the collection and analysis of biometrics-related data of many sorts for completely diverse purposes and properties such as reliability, availability, maintainability, security, usability, performance, prediction, prevention, detection, visualization, and so forth and so on. In other words, in any biometric-based application, Big Data is about extracting streams from one or more data points and making sense of those data streams; e.g. drive valuable metrics to support business goals. Examples of biometrics-related data are general or vendor-specific system-events or diverse types of performance and environmental metrics/data (e.g. a verification reject, transaction time, temperature, noise) and many more. Now, in order to motivate and engage your customers or your team to understand value-adds of Big Data in your business case you should be able and confident to present to them tangible numbers via Return on Investment (ROI) calculations. See for example this simple yet advanced ROI calculator that my company has released. It looks at different types of operational costs to then produce ROI numbers by implementing a Big Data tool and Best Practices in order to reduce those costs. I will give you a few simple and practical examples with regards to the properties of Big-Data-in-Biometrics that I mentioned above. For these examples, let’s assume this scenario: you either have just a few or tens-of-thousands biometric capture devices spread over several geographically remote sites and you have the data collection and analysis tool needed for the job. Availability and Visualization: Your goal is to minimize downtime. The metric requirement you want to meet is Operational Availability (Ao) set in your SLA contract [ref. 2]. You also want your Operation and Support Center to easily and instantly see what devices are down. You have your devices to send regular heartbeats to the Big Data tool and it elegantly visualizes availability of your devices on a smartphone, a monitor, a big screen, or all of them. Maintainability: Your goal is to minimize service needs and maintenance costs. The metric requirement you want to meet when resolving issues is Maximum-Time-to-Recovery. You have the vendor-claimed device reliability metric Mean-Time-To-Failure (MTTF). You track operational hours of all your devices by the Big Data tool and set it to notify you before the MTTF has reached so that you can optimize your preventive or schedule maintenance. This way, you not only can better choose and implement your maintenance strategy (e.g. skip the costly corrective/reactive maintenance type) but you also can minimize potential downtime. Reliability: Your goal is to measure operational reliability of your devices. The vendor-claimed metric (and stated in SLA) you want to verify is either Mean-Time-Between-Failure (MTBF) or Mean-Time-To-Failure (MTTF). You are a group of customers using this type of device and you all need this verification for your SLA contracts. You have your devices to send regular heartbeats to the Big Data tool that registers device failures and calculates the metric. Performance and Usability: Your goal is to measure and compare operational performance/usability between your devices distributed over different locations and user groups. Your metrics are reject rate, failure-to-acquire rate, and transaction time and you have set their corresponding baseline levels using obtained/recommended by the vendors. Your devices stream their transactional data to the Big Data tool. You can 1) view the metrics in real-time 2) have alerts sent to you when thresholds are exceeded 3) get on-demand or periodic device comparison reports. Prediction and Prevention: Your goal is to predict and prevent template aging (or an escalating false reject rate). The Big Data tool is equipped by a specialized prediction algorithm that uses diverse streams of transactional data to pinpoint the issue as an estimate and formatted in time or nr. of transactions. Detection and Security: Your goal is to detect a security breach type (e.g. imposter attacks). You have identified a number of potential vulnerability points that you monitor by your Big Data tool. Configurable alerting rules and messages can be either sent to the system admin or directly to the user. Finally, big data can be used to improve the development of the next generation of products and services. For instance, manufacturers are using data obtained from sensors embedded in products to create innovative after-sales service offerings such as proactive maintenance (preventive measures that take place before a failure occurs or is even noticed). Customer demands: Let’s coin this term: There’s A Metric for That. For, if there is a metric for that then not only there is a customer need for that but also there is an industry-wide language for that to be communicated and used between the market and industry (via e.g. Service Level Agreements, SLAs). Product category definition: Here is how I define it: Big Data tools for biometrics collect and analyze varying types of biometrics-related data to help to achieve diverse business objectives. Standardization: There are parts such as terminology and data capture interface that when standardized simplify for everyone. Diversification: tools from different vendors can coexist, be utilized (even in complementary roles in certain deployments), and constantly evolved. Now they’re talking, biometric devices go TCP/IP…: A walk around the recent security show ISC West 2012 in Las Vegas clearly demonstrated that majority of biometric products for physical access control and time and attendance applications are now network-based (see my pictorial coverage). …and, there is a new standard for connectivity: Speaking of increasing connectivity of biometric sensors, if disseminated well, we are going to see lots of WS-BD enabled devices in the marketplace. The NIST WS-BD Team (Web Services – Biometric Devices) recently published NIST Special Publication 500-288 – Specification for WS-Biometric Devices (see: http://bws.nist.gov). ‘Champions of Big Data’, dedicated teams within organizations: In the age of Big Data and Metrics every organization should build a Big Data team to champion the culture of “Think in Metrics”. As ComputerWorld article indicates, role of CIOs and IT managers will advance more towards driving business rather than only keeping infrastructure up and running. I have, in my reference portal for metrics WhatMetric.com, proposed Chief Metrics Officer, CMO, as a key function for any organization and enterprise. Privacy, security, and more: Big Data like any other tool is neutral and can be misused, altered, hacked, illegally accessed and shared and so forth and so on. Regulations and policies have to be in place for successful implementations. 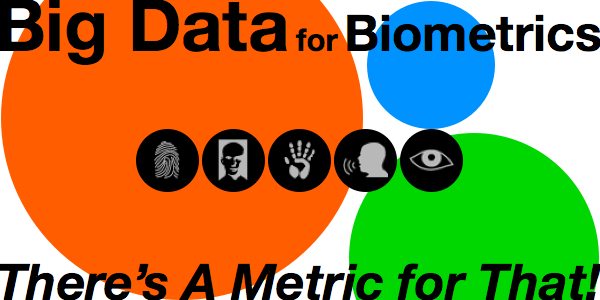 Can the question “How ‘Big Data’ impacts biometrics market and industry” be answered in established metrics? most certainly, and those well-known metrics should be compiled by their specialists, the market and industry analysis companies. I sincerely hope and look forward analysts soon see the logics to publish the reports. What do you expect to see? Your thoughts and comments are most welcome. By the way, Happy World Metrics Day (WMD), its June 16 every year [via ref. 5]. It was a single choice question since LinkedIn doesn’t allow for multiple choice selections. It all started, back in 2002, as an ambitious master’s thesis project performed by the co-founders of Optimum Biometric Labs and presented at the Biometric Identification short course at the UCLA Extension held by Dr. James L. Wayman. Almost 10 R&D years later in a convergence area between several IT disciplines (e.g. biometrics, application performance monitoring, event correlation and analysis), Optimum Biometric Labs packages and releases its know-how and experience in this Best Practices in Biometrics Performance Monitoring Programs. This Best Practices is concerned with the use of standards, methods, processes, frameworks, and IT tools to support end-users’ and businesses’ expectations associated with Reliability, Availability, Maintainability, and Performance of biometric-based verification and identification systems and applications. Biometrics Performance Monitoring (BPM) is using real-time data to detect, diagnose, report, and recover issues, or potential issues, in order to ensure that end-customers’ business goals and requirements are met or exceeded. “We want to celebrate our 10 years progress in Biometrics Performance Monitoring by sharing our know-how with the biometric industry and the end-user community. I think the time is finally right to raise the awareness and bring focus in this important (but until now unclear) area because customers in the market for biometrics should be demanding higher quality of biometrics systems, applications, and services (in terms of Reliability, Availability, Maintainability, and Performance) while keeping the operational costs (such as downtime, maintenance, malfunctions) at a minimum.”, says Babak Goudarzi Pour co-author of this work, CEO and a BPM Evangelist at Optimum Biometric Labs. With introduction of this Best Practices, Optimum Biometrics Labs wants to formally create a new category of products called Biometrics Performance Monitoring (BPM) tools. “We haven’t invented the concept, but we have developed it along with the first specialized, stand-alone, and off-the-shelf software tool in the market for managing the concept (see BioUptime)”, says Babak Goudarzi Pour. He further emphasizes: “We greatly welcome competition and collaboration to expand this opportunity and discipline. In the market place any given biometric deployment is in fact mission critical when it needs to perform its task for its users and business owner; whether that installation is an Automated Border Control system or a biometric school lunch system”. By meeting us at BCC 2011 in Tampa, FL (September 27-29), we are at Booth # 211 with our partner AFIS and Biometrics Consulting Inc. Babak will go around to meet with vendors and to share a ticket with QR-code for easy access to the lecture’s information page and for registering early interest from smart phones and tablets. About Optimum Biometric Labs: Founded in 2003 in Sweden, Optimum Biometric Labs develops, markets, and sells BioUptime which is a monitoring software for supervising infrastructure reliability, availability, maintainability, and performance. BioUptime monitors critical hardware and software elements and subsystem components such as biometric capture devices, applications, services, usage, and more. The product’s key benefits enable customers to 1) measure, meet and exceed service level agreements 2) reduce maintenance and operational costs, 3) maximize operational performance, reliability, and availability. Optimum Biometric Labs also specializes in biometrics and BioUptime-related professional services. Come and see us at BCC 2011, Biometric Consortium Conference and Technology Expo at the Tampa Convention Center, Tampa, FL, USA on September 27 – 29, 2011. We will demo how BioUptime monitors the enrollment module of BIMS (Biometrics Identification on the Move System). BIMS is a DHS-sponsored project led by AFIS and Biometrics Consulting Inc.
We are at Booth # 211 with our partner AFIS and Biometrics Consulting Inc.
We just merged and redesigned our websites and moved to the more powerful and versatile WordPress.com from the Google environment (Sites and Blogger). We did this in order to simplify and improve usability and accessibility and to prepare for our amazing upcoming launches. And last but not least.. the fantastic WordPress as an expandable platform: “WordPress is now powering 14.7% of the top million websites in the world and 22% of new active websites in the U.S.”, read the TechCrunch article. Your feedback is very welcome, Thanks! We have made several trips to Washington D.C. and met with prime contractors, system integrators as well as the end-customers within the US Government. Due to the excellent responses and potential sales opportunities, we are now seeking Value Added Resellers in the US-market for our monitoring system BioUptime. A new BioUptime Developer Program is being developed to support partners to easily integrate and apply the monitoring functionalities to biometric devices, services and applications.